Nick Grimshaw and Harry Styles received quite a mocking on Wednesday morning, when they turned up to host his Radio 1 breakfast show, while clearly not at all sober. The 28 year old DJ and 19 year old One Direction singer had spent the evening before at The Brit Awards and the hours after partying hard at a number of star studded bashes in London and when it was time for Nick to rush to Maida Vale and start work, he and Haz were still under the influence of all that free champagne. 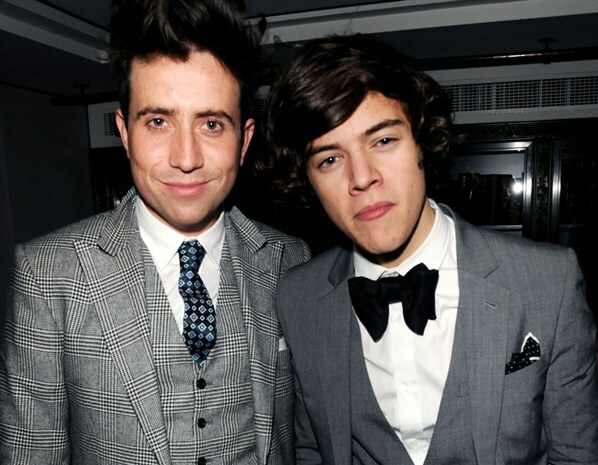 Grimshaw took the reigns on the daily show and announced the 1D singer as his secret celebrity guest, before hinting that he hadn’t even been to bed yet. Styles had taken his mum Anne Cox to the Sony after party, where they spent some of the evening with his record label boss Simon Cowell, his bandmates, the Little Mix girls and Caroline Flack. However he soon ditched the bash for another across the city, where he met Nick. Harry complained on air that the show was “too early” for him, even though he hadn’t yet slept, and he was pictured leaving Grimmys home where they cleaned up after their huge bender. Nick asked his pal if he had been scared at the awards ceremony the night before and he confessed: “I was really scared actually” before admitting that his lip had even been wobbling! “It’s alright, I won it”.